Introduced to the world by Luxaflex® in the 1950s, Venetian Blinds offer you precise control of light intensity and direction with the quick twist of a wand. An ever expanding range of colours, finishes, and slat widths to choose from, you can transform any room into a style that is completely your own. 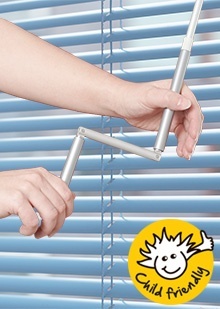 Our Venetian Blinds feature Child Safe systems including motorised systems, tensioned models, handle control, crank operation, chain tensioner and cord cleat. Tilt & turn window solution Frontfix is specifically designed for tilt and turn windows and can be fully integrated into the window frame. 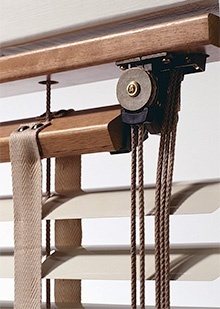 Side guides, incorporated within the system, maintain the blind in position when window is angled open. Stylish headrail Evolution is a stylish headrail with an operation mechanism in view. This product gives a romantic and classic feeling. 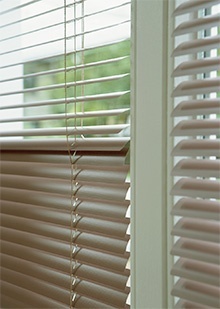 Available in 50mm Venetian Blinds. Aluminium valance Fusion is an aluminium decorative valance, Design and Stylish! Tensioned models These systems are designed to fit neatly into the frame of your windows, doors and skylights and eliminate the need for free hanging cord loops. Flexible light control Variozone™ is the ultimate in flexible light control. A patented solution allowing you to open or close any segment of your blind to create the optimal combination of light and privacy. Ideal for bathrooms, street-facing windows, or offices in need of a balanced approach to privacy and glare control. No light leakage Luxaflex Lightline® is specifically designed to prevent light leakage from around the vertical cords used to raise and lower the blinds. This ensure that no cord holes are visible, enhancing the overall look and room darkening characteristics of the product. Motorization A wide variety of Luxaflex® products are offered with motorised options that allow the product to be operated at the touch of a button. The remote control operation or wall switch eliminates operating cords for enhanced child safety and user comfort. Crank operation Our special crank operation integrates both lift and tilt functions into one easy-to-use crank. The charm of our Venetian Blinds lies in their versatility. First introduced to the world by Luxaflex® in the 1950s, our Venetian Blinds offer you precise control of light intensity and direction with the quick twist of a wand. And with an ever expanding range of colours, finishes, and slat widths to choose from, you can transform any room in a style that is completely your own. 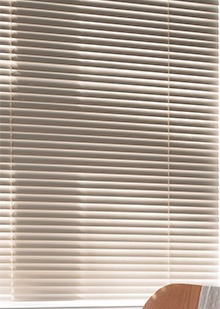 The new 25mm MegaView™ Venetian Blind, offers you that extra view and privacy control that you might be looking for. Available in all colours, this blind closes as a normal 25mm blind, but when you open it, a MegaView™ outside view is presented, by doubling the view through to the outside. Designed exclusively for Luxaflex®. The innovative MegaView™ system is built upon the well-known 25mm Venetian Blind, by using a technology that ‘sticks’ two slats together when opening, so an extended view-through is created. The blind closes as you would expect from a Luxaflex® Venetian Blind, providing you with the most optimal light and privacy control. To extend our offering for every size of window, particularly for larger windows in your home or office, we now offer a Venetian Blind with 70 mm wide slats. This product is available with standard cord operation as well as a motorised version for more comfort and control. Available in 30 of our most inspiring colours, for different styles and trends to meet your preferences for your interior. The new 70mm Venetian Blind is based on an existing and proven hardware system. To enhance the look and give a personal touch one can add fabric tape, in a plain colour or a decorative print to the 70mm Venetian Blinds. Also a design Fusion valance is optional available for the finishing touch. Luxaflex® offers you a range of possibilities to personalise your Venetian Blind, and create the best possible match in colour and style with your interior. Plain coloured fabric tapes can be chosen for 35, 50 and 70mm slats. Fabric tapes with decorative prints are also available for 50 and 70mm Venetian Blinds. 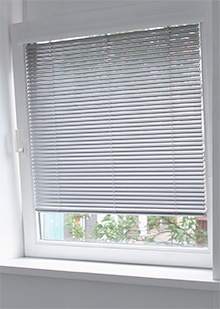 It is possible to personalise your blind by adding multiple colours of slats in your blind, or just add an exciting border effect to your blind, for a subtle or dynamic look. Again your style counts. Do you want privacy but still allow light in your house? Do you want to lose the glimmering on your computer screen or television? Variozone® is the blind that you can open in segments; top open, bottom closed; top closed, bottom open; or open in the middle, whichever suits you best. 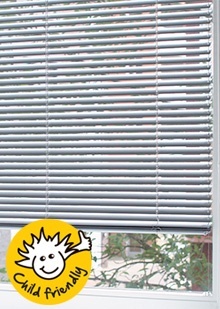 This blind can of course be completely closed and opened like any standard Luxaflex® Venetian Blind. Extensive range of comfortable operating systems Luxaflex® Venetian blinds are operated as standard by using a raise cord and a tilt wand. Several other optional and comfortable solutions are available to you: hand operated bottom rail, Tilt-Only with remote control, full electrical operation, endless chain and many more…all to make the use and comfort as optimal as possible. Thermostop™ is a good reflector. In summer this may help to reflect solar energy to the outside lowering the inside temperature and the need for additional cooling. In winter, when fully closed it can be fairly effective in keeping heat indoors. 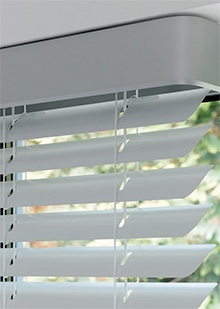 Luxaflex® has been developing the Venetian Blind for many years. Also this year the range of models has been extended. A new slat width has been added to the portfolio. After 16, 25, 35 and 50, 70 mm has been added for a beautiful look for bigger sized windows. For a classic design with an optimal choice in colours and finishes A classically designed wooden headrail and bottom rail, in combination with a wide offering in colours of 50 mm slat, make this a must for every home. Combine with fabric tape and personalise this blind to the style of your room and interior design.